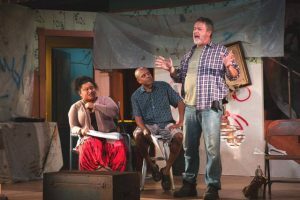 The American theatre has a real-life, intrepid, grownup playwright in Bruce Norris who is isn’t intimidated by questionable social mores that have been sequestered and festering under society’s radar screens for decades. “Clybourne Park”, is an in-your-face comedy under the clever direction of Artistic Director Michael Shaw that deftly navigates the turbulent waters of America’s history with racism. Act One is set in segregated Chicago’s Clybourne Park northwest side neighborhood in 1959. Act Two is set in the same neighborhood, in the same house, fifty years later. Both acts deliver the comedy’s many ‘seat-squirming’ moments where the characters tell it like it is, at least, from their perspectives. The candid dialogue results in thought-provoking comedy with hard edges and loads of laughs. One could say, that the shock-of-recognition-effect, allows for both positive and negative points of view to feel liberated enough to engage head to head, in an honest depiction of life in Chicago of the 1950s and fifty years later. It’s a case of what goes around comes around and, it’s hilariously performed. Director Shaw has gathered an intelligent and talented cast of seven local performers and one Los Angeles Equity actor that deliver the comedy goods no matter whose bull is being gored. Leading the terrific ensemble cast in order of appearance are: David Youse as Russ/Ken, Theresa Jewett as Bev/Kathy, Desiree Clarke as Francine/Lena, Robert Rancano as Jim/Tom, Robert Ramirez as Albert/Kevin, Rob Hubler as Karl/Steve, Phylicia Mason as Betsy/Lindsey, and Sean Timothy Brown as Kenneth. Act One, centers on one home in a white neighborhood that has a black family interested in purchasing it. The white family is being pressured not sell to the black couple by the neighborhood homeowners association. The neighbors fear the sale will promote white flight from their comfortable, upscale neighborhood. In Act Two, fifty years later, the actors play different characters, but the issues are similar but with an ironic twist. The beauty of this play lies in the performances of the actors and how the characters resolve their issues is the meat as well as the enjoyment of the play. It’s a highly entertaining show, however, it’s somewhat of a cautionary tale about who we were as a society fifty years ago and how far we think we have come. When current events (like Ferguson, MO, and Baltimore, MD) negate the gains, it only means that we, as a society, have more challenges and more work still to do. Also, the coda at the end of Act Two between Sean Timothy Brown and David Youse is a misty-eyed, compelling, poignant, and powerful moment, that leaves the audience sitting in stunned silence. There’s bound to be audience members that may find the carefully crafted dialogue offensive due the incendiary nature of the plot and the social mores of the day. The dialogue is sprinkled with language that echo the vernacular of the streets, so you might want to leave the kiddies and grandkids at home. In the technical department led by director Shaw, Set Designer Thomas L.Valach creates the appropriate space for the actors to work their magic. Award-winning Lighting Designer Phil Murphy provides the lights that allow the audience to see and appreciate the costumes designed by Jim Lapidus. Sound Designer and Producer Clark Dugger is the group’s technical wizard and ‘go to guy’ for finishing touches and flourishes in all things technical. James Geier is the Wig Designer, and Diane McClure stage manages. 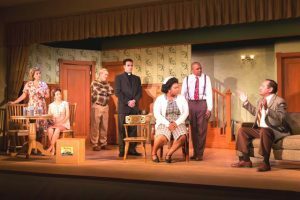 “Clybourne Park” performs at the Palm Springs Woman’s Club on the Pearl McManus stage through January 22nd. For reservations and ticket information call 760-322-0179. Don’t Miss It!